If you’re planning to take some time to enjoy the beautiful sites and friendly culture Halifax has to offer, here are some insider tips from those who know the city best. Be sure to take a stroll along the downtown waterfront boardwalk. Hugging the harbour for 10 city blocks from Pier 21 to Casino Nova Scotia, the boardwalk follows the water’s edge past shops, restaurants, attractions and the Historic Properties district. You’ll also stumble upon some interesting art installations along the way! 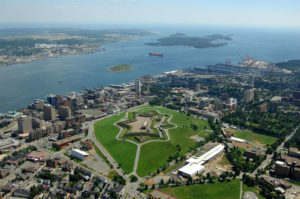 Looking for an amazing view and photo op of downtown Halifax? Head up the steps by the Old Town Clock to the Halifax Citadel (it’s also a great spot to see the sunrise in Halifax). The Halifax Central Library on Spring Garden Road has received many accolades including winning the national 2016 Governor General Architecture Medal. Locals and visitors alike are drawn to this cultural hub of downtown Halifax. Make sure to pop up to the 5th floor where you can enjoy a coffee and soak up the views from the Rooftop Patio and “Halifax’s Living Room”. Take a ferry ride to Dartmouth. The Harbour Ferry is the oldest, continuous, salt-water passenger ferry service in North America. The ferries criss-cross the second largest natural harbour in the world every 15 minutes during peak hours. The Dartmouth waterfront also happens to be one of the top 10 places to watch the sunset in Halifax. Halifax’s official food, the donair is a sweet and spicy treat. It’s a uniquely Nova Scotian delicacy (that’s usually enjoyed late-night). There are countless places to buy one in Halifax, including some spots close to the Halifax Convention Centre such as Johnny K’s Authentic Donairs. Take part in a local Saturday morning tradition and visit the Halifax Seaport Farmers’ Market. Located right on the waterfront with a beautiful rooftop patio, it’s no wonder Haligonians head to the market for breakfast and enjoy the view. North America’s oldest continually-operating farmers’ market boasts over 250 vendors offering fresh produce, baked treats, hand crafted items and other delightful surprises. Did you know that some of the finest crystal in the world is made in Nova Scotia? Stop by NovaScotian Crystal on the waterfront for a live demonstration of a centuries-old tradition, and perhaps pick up a very special souvenir from Halifax. If you’re wondering where to go to get your coffee fix (and maybe a little sweet treat! ), there are some fantastic spots to choose from such as Le French Fix Pâtisserie, The Old Apothecary Bakery & Café or Weird Harbour Espresso Bar. For more local favourites, check out the “Best Places to Get a Coffee”. Halifax is home to Atlantic Canada’s only national Museum – The Canadian Museum of Immigration at Pier 21. Plan a visit to this National Historic Site which was the gateway to Canada for one million immigrants between 1928 and 1971. It also served as the departure point for 500,000 Canadian Military personnel during the Second World War. 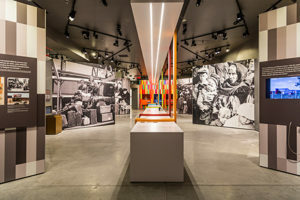 Did you know that The Scotiabank Family History Centre located at Pier 21 is a free reference service to help you trace your own family immigration story? Halifax is known for its vibrant nightlife and pub culture. Be sure not to miss the iconic Lower Deck and Durty Nelly’s. This authentic Irish pub was completely designed and built in Dublin! It traveled across the Atlantic, and was reconstructed piece by piece in Halifax. It also just so happens to be conveniently located just steps away from the Halifax Convention Centre!